Our online virtual tour enables visitors to interactively explore St Paul's Cathedral, London. Visitors may view 23 different areas of the cathedral through 360° panoramas, maps, narrated mini-movies, music and text. A small 360° panorama above a clickable map allows a quick view of any area. Having spotted something of interest, visitors can then click to open a window with a much larger and higher quality 360° panorama, and then zoom in and pan around for a detailed inspection. 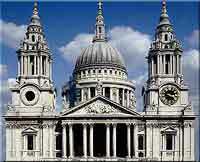 For example: To view Sir Christopher Wren's original design - The Great Model. At any point, visitors can view narrated mini-movies about the people, architecture, politics and history of the site (also includes full Text for the hearing-impaired). An easy-to-follow map also ensures that, unlike a real tourist, our virtual visitors can jump around the cathedral with a single click. There are even exclusive 360° panoramic views taken from the Golden Gallery Roof and in the Crypt Treasury. All of our panoramas have descriptive narration, music, integrated text for the hearing-impaired, and MS Word files with pictures. Four hundred years of British history are brought to life, with the key figures and topics being presented in 26 specially produced movies (suitable for both broadband and dialup connection). These include video essays on the main features of the cathedral, such as its High Altar, the Crypt Treasury, the wedding of Prince Charles and Princess Diana, the Great Circle, the religious art, and especially those features not visible to most tourists.